Delivering your gifts for the holiday season is a great way to show people how much you care. Let’s face it, to get the best deals; you’ll need to go online. Most sites feature a “Gifting” option, so cut out the middle man and have your gifts delivered right to your friend or family member’s doorstep. The Gift List makes it simple and easy to do so. 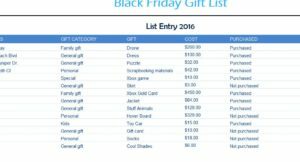 The Black Friday Gift List will take you through columns in which to enter the recipient’s contact information, the cost of your gift, and whether it has been shipped/received. This handy Excel document tells you exactly what you need to enter, so all you have to do is shop! It’s really that easy. Take a look at the three tabs near the bottom of this template. Begin in the “List Info” section. This is where you create the drop-down menus that you will utilize throughout the main tabs of the template. There is a space for your budget for each person and the type of gift you are thinking about getting them. Now go to the “List Entry” tab. You will go through the header, entering the information listed above into each row. Remember to use the drop-down menus for the “For” “Gift Category” “Purchased” “Delivery Status” and “Wrapped Status” to make things easier. Finally, once you’ve finished entering all this information into the appropriate columns, you will go to the “Holiday List” tab for a complete overview of your budget and the status of all your gifts for each person. You know that some of the best Black Friday deals happen online. To make your shopping and gift giving experience as simple as possible, this free template allows you to organize your online holiday shopping and send your gifts directly to your recipient or to you for packaging first, seeing the status of delivery and wrapping at the same time.